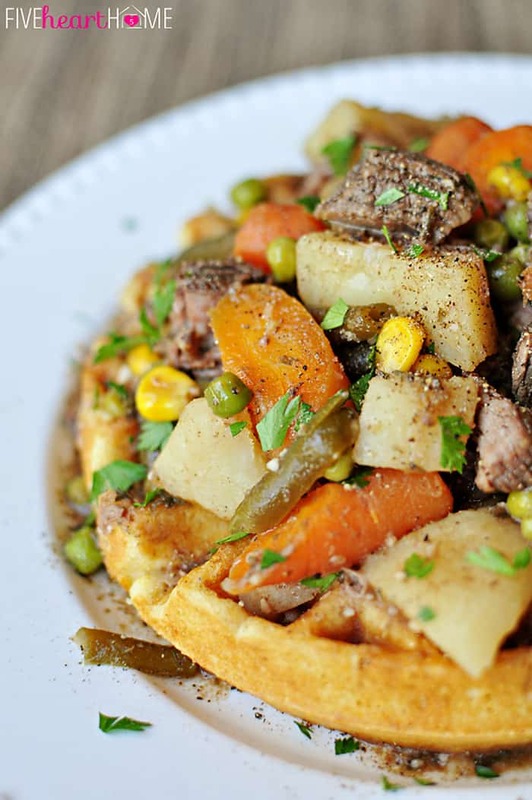 Flavorful beef stew, loaded with vegetables, seasoned with herbs and balsamic vinegar, and served over cornbread waffles, makes for a fun and effortless slow cooker meal! 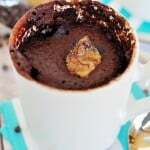 Do you ever get stuck in a rut when it comes to dinner menu planning? I have to admit that I do. 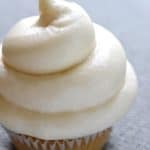 Making those tried and true recipes is often just easier than trying something new. 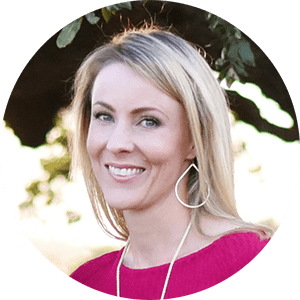 There’s little thought required in cooking an old standby, since I practically have it memorized, and there’s no question as to how kiddos will react to their dinner offerings, since I already know. Beef stew is one of those meals for me. 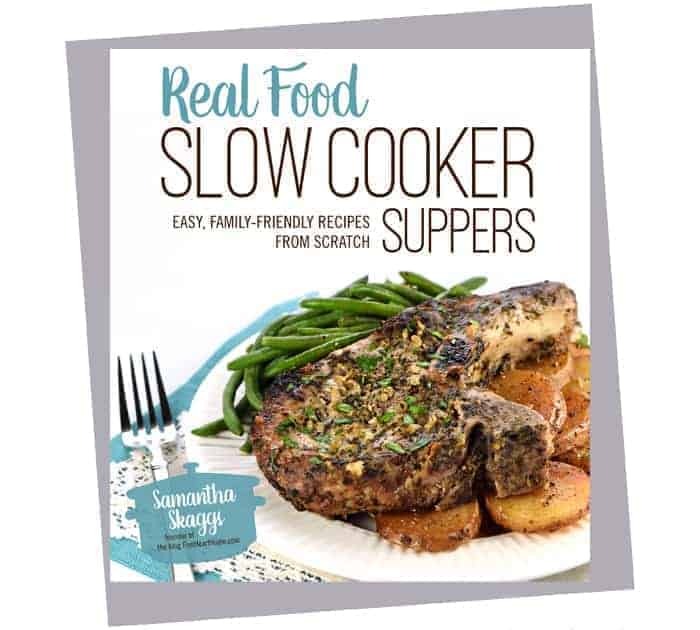 It involves quick and easy prep and does the rest of work on its own in the crock pot. It incorporates lots of veggies, which is always a win. And I can predict which kid will clean her plate, which kid will pick out all of the green beans, and which kid will do his best to avoid the carrots. But the downside? It’s kind of boring. So I recently decided to take my favorite beef stew recipe and jazz it up a bit, lending depth of flavor with extra dried herbs, balsamic vinegar, and tomato paste. The results? 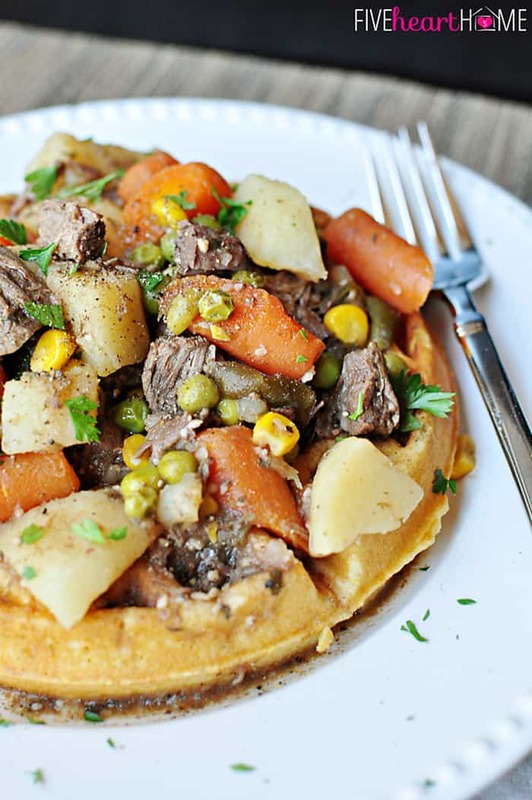 Ordinary, predictable beef stew got a little kick! And to make if even more exciting (or at least as exciting as one can get when referring to beef stew), I decided to bake up my typical cornbread muffins in the form of cornbread waffles instead. I don’t know about you, but I pretty much can’t eat beef stew without first crumbling cornbread into it. 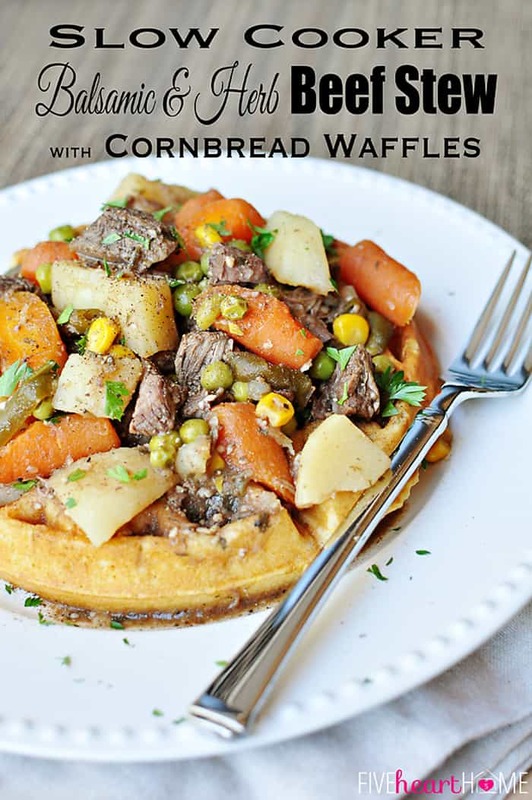 But cornbread waffles? Well, not only are they fun to eat, and not only do they serve to soak up the juices of the stew, but they also bake up in no time. 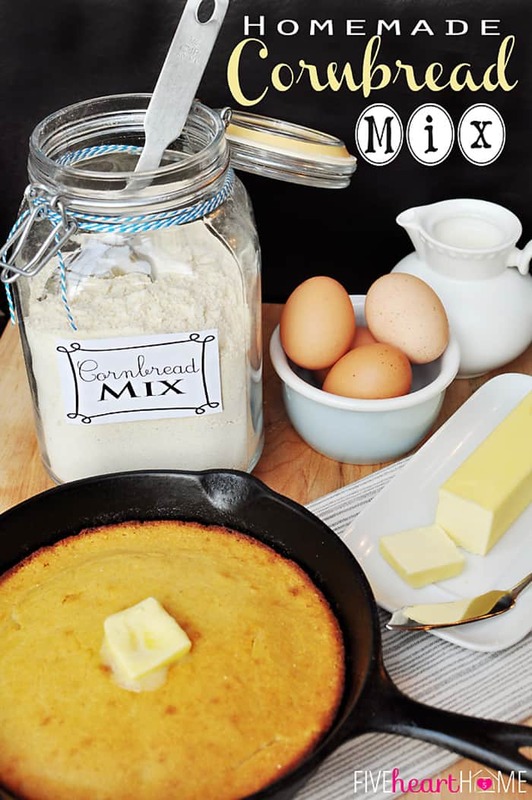 Think about it…standard cornbread, baked in a pan or skillet or muffin tin, takes anywhere from 15 to 25 minutes to bake. But what if you’re in a hurry? Well, first you pull your Homemade Cornbread Mix out of the pantry and mix it up in a flash. And then you pour your batter into the waffle iron, which results in piping hot cornbread in mere minutes. And then your family oohs and aahs over waffles for dinner. Because waffles make any meal more fun, right? Right. Winter’s not over yet, so there’s plenty of time left to whip up a pot of hearty, comforting beef stew. And don’t forget the cornbread waffles! This meal will warm up your toes and it’s good for your soul…and what more can you ask of a dinner than that? 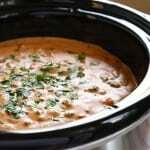 Place meat in the bottom of large slow cooker. 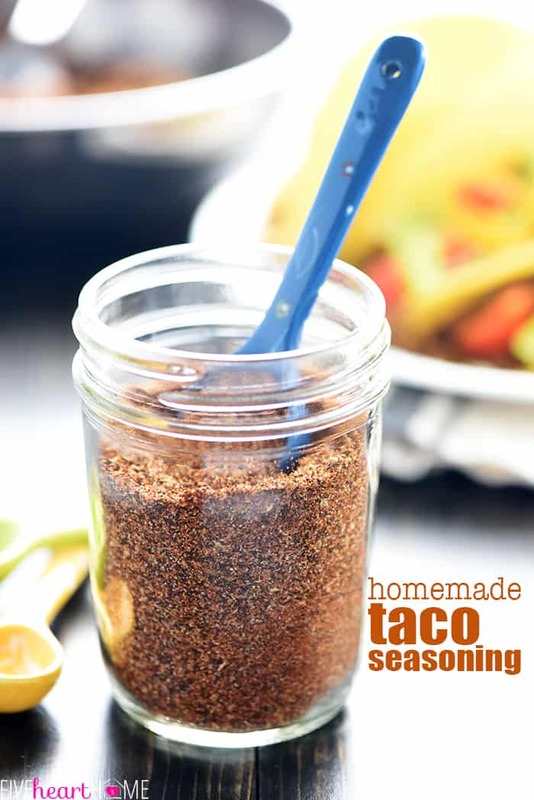 Top with garlic and sprinkle with dried herbs, bay leaves, and freshly ground black pepper. Pour beef broth over meat, and add balsamic vinegar, tomato paste, potatoes, carrots, green beans, corn, and peas to crock pot. Give everything a stir and cook on low for 8 to 10 hours or high for 4 to 5 hours. 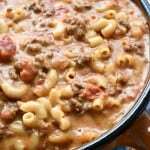 About an hour before serving, use a fork to stir cornstarch into 3 tablespoons of water and pour in crock pot, stirring to distribute. Replace lid and allow broth to thicken slightly as stew finishes cooking. Season with salt, if needed, and additional pepper, to taste. Instead of beef broth, I typically use water plus Organic Better Than Bouillon Beef Base. 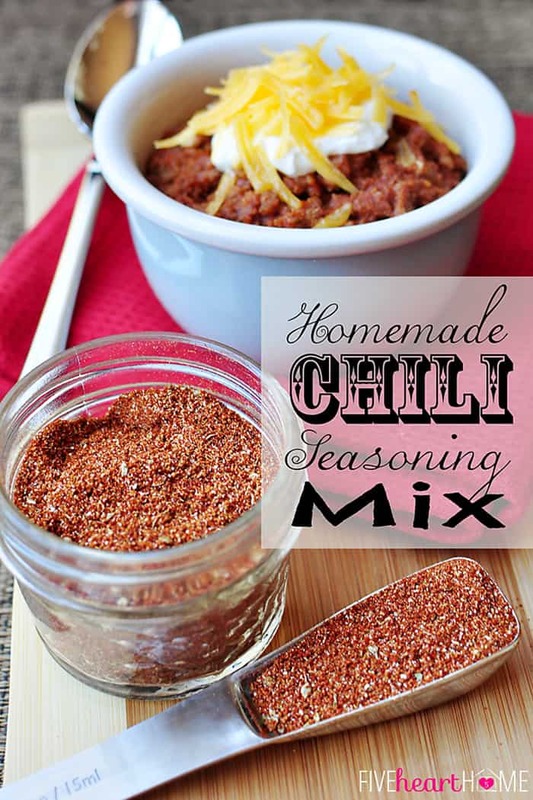 Additional salt may be unnecessary in this recipe depending on how salty your beef broth is. If you have fresh parsley, you may add 1/4 cup or more in the last hour of cooking time (in lieu of using dried parsley earlier in the recipe). They definitely find comfort in what’s already familiar to them, don’t they, Kathy? 😉 Glad to know I’m not the only one who struggles with this! 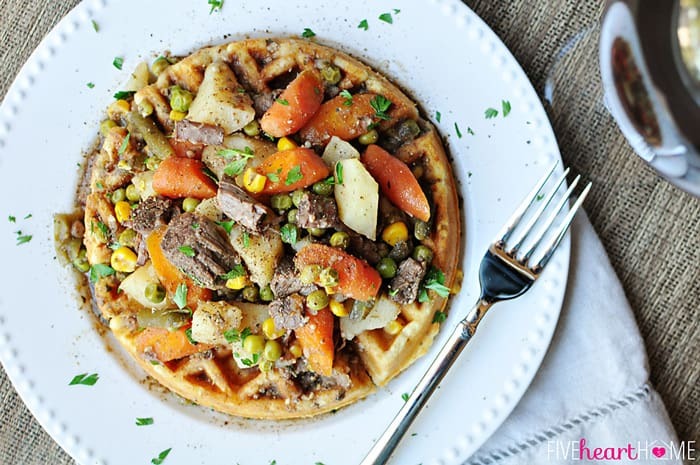 Never heard of waffles with beef stew but it certainly looks good! Brilliant! Thanks, Melanie! This was my first time to try this particular combo. I’ve made cornbread in the waffle maker to accompany chili before, but I thought it would be equally tasty with beef stew. 🙂 Hope you enjoy it if you get to try it! What a fun idea Samantha, I love it! I need to get my head outside of the box and use my waffle maker for something other than waffles. 🙂 I can’t wait to try this! And you are officially a genius! If only I had a waffle maker…but I needed to tell what a great idea I thought you had…thanks for posting it on Mandy’s Recipe Box. One day, I WILL have a waffle maker and I WILL try cornbread waffles and chilli and I WILL think back to your blog. Thanks! Hmm, how about a twist on Mexican Albondigas Soup…serve the albondigas on top of the waffle and a bowl of the broth next to the waffles? Yum, Christine…I like the way you think! 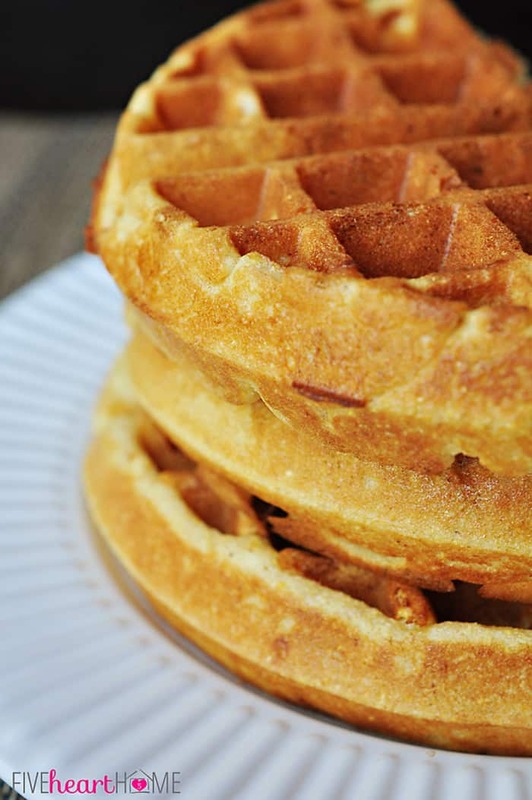 And I particularly admire your dessert-like ideas for these cornbread waffles! Treating them like a sopapilla might be good, too? 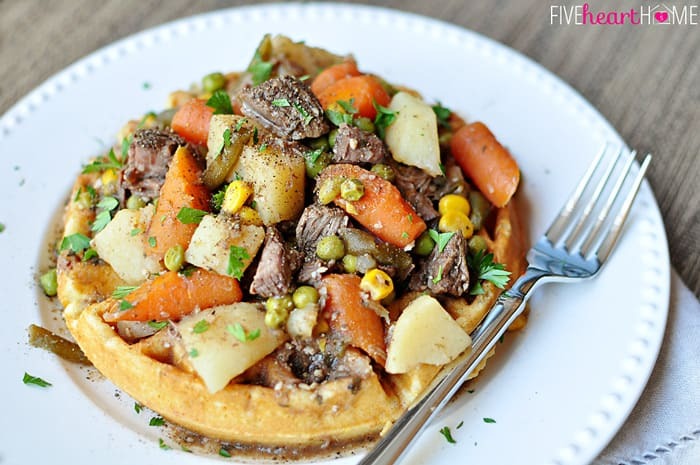 GREAT idea to serve this over waffles…such a fun way to liven up beef stew! 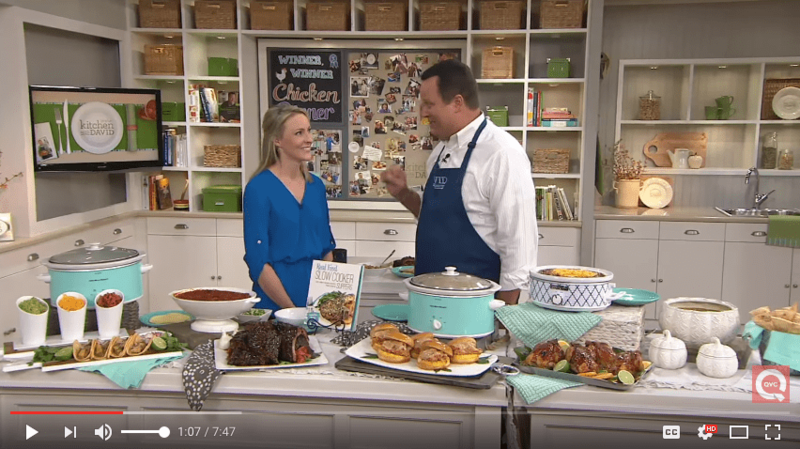 This is one of my family’s favorite weeknight dinners! It’s a delicious one-bowl meal. The balsamic gives it just the right amount of tang. I sear the stew meat before adding it to the slow cooker. 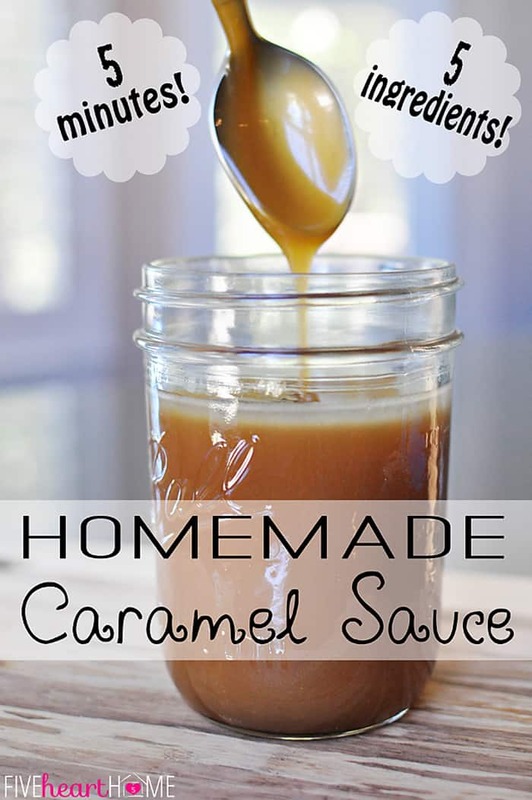 The caramelization adds even more depth of flavor to a great dish. I serve it over homemade cornbread because I’m too lazy to get out my waffle iron. Definitely a winner!